Joe B. Silva was born in the Azores and later became part of the East Bay’s thriving Portuguese community. I know little of his life because my sources are limited and because “Joe Silva” is an extremely common name. I just know he was born in 1876 and died in 1962. His first wife, Mary Rose, bore seven children and died in 1938. She was to be buried in St. Mary’s, but FindaGrave has no record of her or Joe. His second wife was named Gertrude. Both were Portuguese. The Portuguese have a long and complex history in America, as summarized in a timeline from the Library of Congress. The same is true for California. There were divisions between the continental and Azorean/Madeiran Portuguese, who came here at different times for different reasons. The Oakland Tribune named Silva as the Grand President of the “Protective Association Union Madeiran Society” (Associação Protectora União Madeirense do Estado da Califórnia, or União Madeirense for short), which was founded in 1913 in West Oakland. A continental Portuguese society was founded here four years later. 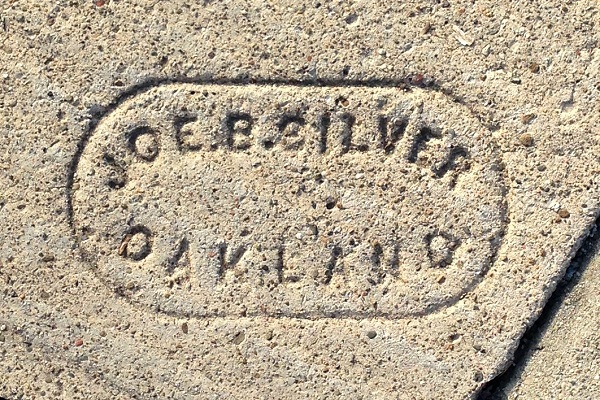 I’ve seen only three of these in Oakland, one of which is dated 1922. Why did such a proud and prominent Azorean use an Anglicized name? There were Portuguese concrete contractors before this, like the Azorean Construction Company (1909), Francisco Comachao (1912) and M. Gonçalves (1914), but most Portuguese names did not emerge on our sidewalks until the mid-1920s and later. Be that as it may, Silva soon came out with a new stamp using his real name. The earliest of these I’ve found is from June 1924, and the latest is 1937. Oakland directories from 1923 to 1940 listed Silva at 2209 E. 15th Street. 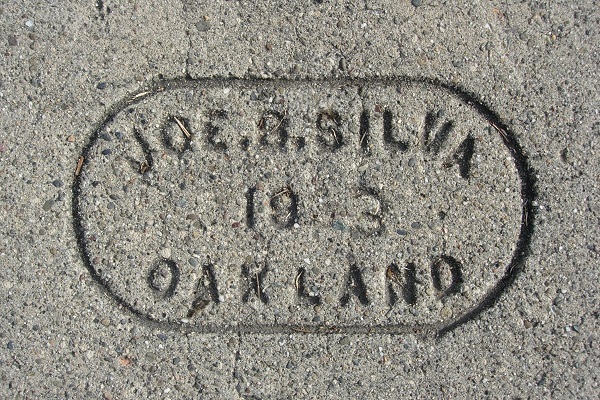 He may also have collaborated with Albert Moniz, who hand-drew several different “Moniz-Silva” marks without dates, but I think that was more likely the much younger A. J. Silva. This entry was posted on 30 June 2017 at 8:02 am and is filed under Profiles. You can follow any responses to this entry through the RSS 2.0 feed. You can skip to the end and leave a response. Pinging is currently not allowed.